Is it really a gunshot? Sometimes shotgun injuries are reported as gunshots. Big difference! Will I need to preserve evidence? In general, yes. In most cases other than suicide attempts, there is probably a good chance that criminal activity was involved. Be prepared to preserve all patient belongings in paper bags, and have a chain of custody form available. Am I and my team safe? There is a possibility that someone wants your incoming patient dead. They may want to finish the job, in you emergency department. Make sure the area is secure. Once the patient arrives, it’s best to think through things via the ATLS framework. Airway. If the injury involves the lower part of the face or neck, make sure the airway is safe and/or secure. Blood may create problems, as can edema from injury to soft tissues, especially in the floor of the mouth. Breathing. Not a problem with these injuries unless significant aspiration has occurred. Circulation. The face can really bleed, and only a few areas are amenable to the usual surgical control (clamping, tying). Direct pressure must be used for the rest, and this doesn’t always work. Bleeding from sinuses may be controlled with packing or the foley catheter trick (inserted through bullet tract). But if you can’t stop it, then it’s time to expedite to the OR. Disability. You do have to worry about the cervical spine if the path of the bullet is not obvious. If the patient is stable, immobilize the neck and use the CT scanner to see if any fragments involved the spine. If you must run to the OR with an unstable patient, then try to quickly shoot an old-fashioned cross-table lateral. This will give you quick and dirty info on how much you can manipulate the neck. Lead poisoning from a gunshot? Finding pneumomediastinum on a chest xray or CT scan always gets one’s attention. However, seeing this condition after a simple fall from standing is very simple to evaluate and manage. Blunt injury to the esophagus is extremely rare, and probably nonexistent after just falling down. Likewise, a tracheal injury from falling over is unheard of. Both of these injuries are far more common with penetrating trauma. This leaves the lung and smaller airways within it to consider. They are, by far, the most common sources of pneumomediastinum. 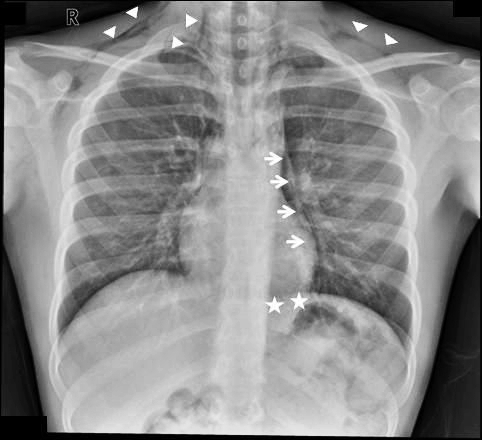 The most common pattern is that this injury causes a small pneumothorax, which dissects into the mediastinum over time. On occasion, the leak tracks along the visceral pleura and moves directly to the mediastinum. Management is simple: a repeat chest xray after 6 hours is needed to show non-progression of any pneumothorax, occult or obvious. This image will usually show that the mediastinal air is diminishing as well. There is no need for the patient to be kept NPO or in bed. Monitor any subjective complaints and if all progresses as expected, they can be discharged after a very brief stay. 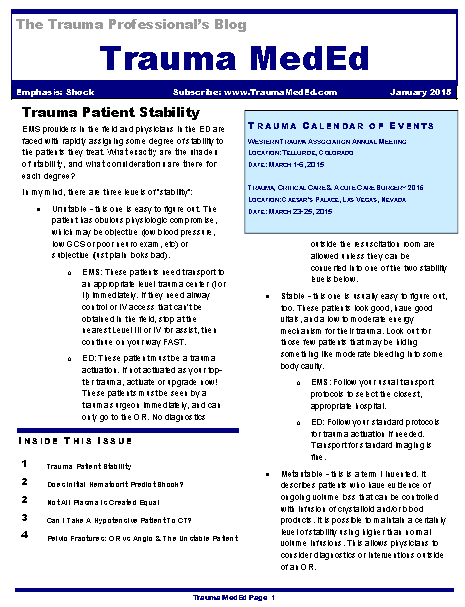 The January newsletter is now available! Click the image below or the link at the bottom to download. This month’s topic is “Shock”. Does initial hematocrit predict shock? Can I take a hypotensive patient to CT? Subscribers received the newsletter first at the end of last week. If you want to subscribe (and download back issues), click here. Click here to download the current issue. Trauma service staffing is important to maintaining trauma center status. Teaching centers in the US have been grappling with resident work hour rules, and non-teaching centers have always had to deal with how to adequately staff their trauma service. What is the impact of staffing a trauma center with midlevel practitioners (MLPs) such as physician assistants and nurse practitioners? A state designated Level I trauma center in Pennsylvania retrospectively examined the effect of adding MLPs to an existing complement of residents on their trauma service. They examined the usual outcomes, including complications, lengths of stay, ED dwell times and mortality. ED dwell time decreased for trauma activations and transfers in, but it increased for trauma consults. Of note, data on dwell times suffered from inconsistent charting. Bottom line: There is a growing body of literature showing the benefits of employing midlevel providers in trauma programs. Whereas residents may have a variable interest in the trauma service based on their career goals, MLPs are professionally dedicated to this task. This study demonstrates a creative and safe solution for managing daily clinical activity on a busy trauma service. Reference: Utilization of PAs and NPs at a level I trauma center: effects on outcomes. J Amer Acad Physician Assts, July 2011. Traumatic brain injury (TBI) frightens and confuses most trauma professionals. The brain and its workings are a mystery, and there is very little real science behind a lot of what we do for TBI. One thing that we do know is that intracranial hypertension is bad. And another is that we do have some potent drugs (mannitol, hypertonic saline) to treat it emergently. So if we can “dry out” the brain tissue on a moment’s notice and drop the ICP a bit with a hit of sodium, doesn’t it stand to reason that elevating the sodium level constantly might keep the brain from becoming edematous in the first place? Many neurosurgeons buy into this, and have developed protocols to maintain serum sodium levels in the mid-140s and higher. But what about the science? A nice review was published in Neurocritical care which identified the 3 (!) papers that have promoted this practice in humans with TBI. In general, there was a decrease in ICP in the patients in the cited papers. Unfortunately, there were also a number of serious and sometimes fatal complications, including pulmonary edema and renal failure requiring hemodialysis. These complications generally correlated with the degree of hypernatremia induced. Papers were also reviewed that involved patients with other brain injury, not caused by trauma. Results were similar. Bottom line: There is no good literature support, standard of care, or even consensus opinion for prophylactically inducing hypernatremia in patients with TBI. The little literature there is involves patients with severe TBI and ICP monitors in place. There is nothing written yet that justifies the expense (ICU level care) and patient discomfort (frequent blood draws) of using this therapy in patients with milder brain injury and a reliable physical exam. If you want to try out this relatively untried therapy, do us all a favor and design a nice study to show that the benefits truly outweigh the risks. And if you can point me to some supportive literature that I’ve missed, please do so! Induced and sustained hypernatremia for the prevention and treatment of cerebral edema following brain injury. Neurocrit Care 19:222-231, 2013. Continuous hyperosmolar therapy for traumatic brain injury-induced cerebral edema: as good as it gets, or an iatrogenic secondary insult? J Clin Neurosci 20:30-31, 2013. Continuous hypertonic saline therapy and the occurrence of complications in neurocritically ill patients. Crit Care Med 37(4):1433-1441, 2009. -> Letter to the editor Crit Care Med 37(8):2490-2491, 2009.